John Cullen, originally a constable in the Royal Irish Constabulary, joined New Zealand's Armed Constabulary in 1876 and rose to become police commissioner in 1912. A highly controversial figure, in 1916 Cullen organised and led a raid by 60 armed police to Maungapōhatu in the heart of the Urewera, to arrest the Māori prophet Rua Kēnana. A gun battle broke out and two of Rua's followers, including his son, were killed. 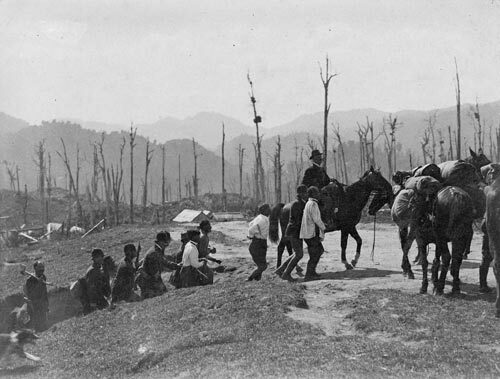 This photo shows Cullen on horseback leading Rua, another son and other prisoners, plus several of the police party. Most charges against the prisoners were later dropped, and the Supreme Court declared the arrests to have been illegal.